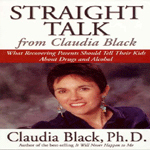 Claudia Black is an internationally recognized author and speaker on addiction and recovery. 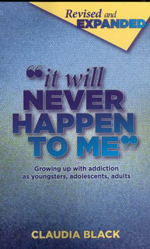 Her best-selling books offer models of intervention and treatment related to addictive disorders, relapse, co-dependency, family violence, anger, depression, and women’s issues. While some of her writings are geared towards professionals, many of her books are written for the layperson, including parents who face addictive behavior in their children, and children who try to understand issues adults in their lives are struggling with. Among the many books Black has authored are It Will Never Happen to Me; Changing Course; My Dad Loves Me; My Dad Has A Disease; Repeat After Me; It's Never Too Late To Have A Happy Childhood; The Missing Piece; Anger Guide, the Relapse Toolkit; A Hole in the Sidewalk; Depression Strategies; and Straight Talk. 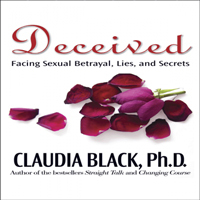 Black's latest book, Deceived: Facing Sexual Betrayal, Lies, and Secrets (2009) focuses on men who act out sexually and leave their partners reeling in fear, rage, shame, and isolation. The book helps women better understand what is happening in their lives and outlines proactive steps they can take to build healthier relationships, set non-negotiable boundaries, and make positive changes for themselves and their partners. Black is the recipient of a number of national awards including the Marty Mann Award, the SECAD Award, the National Council on Alcohol and Drug Addiction Educator of the Year, and the 2004 Distinguished Alumni Award from the University of Washington School of Social Work. She has also written articles for many professional magazines and journals, among them Paradigm, Recovery Today, Counselor Magazine, and has appeared on national television and radio programs. For more information on the author and her books check http://www.claudiablack.com/ or http://authorsden.com/claudiablack.